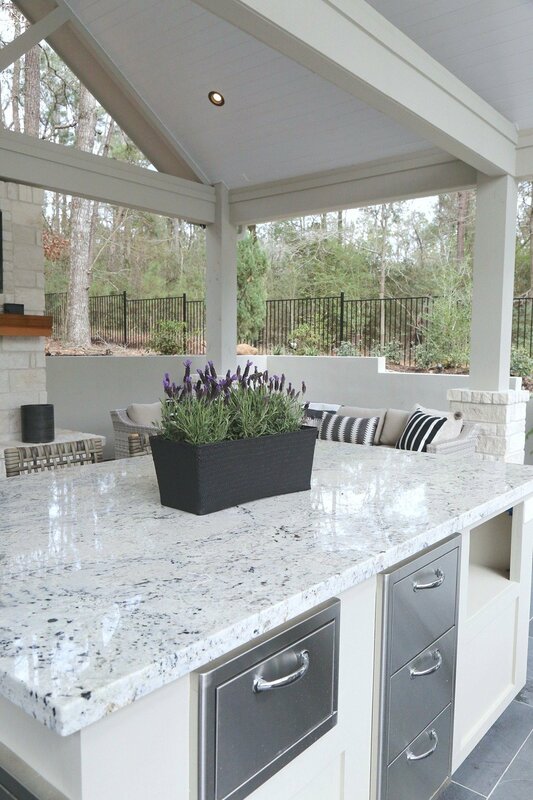 Spring has sprung in East Texas and I have been busy fluffing our new pool house/outdoor kitchen. 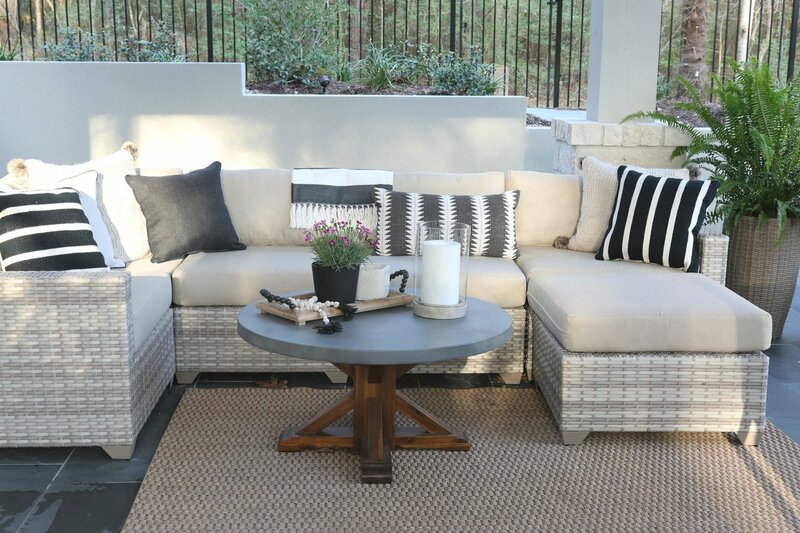 Today I wanted to share some great outdoor patio decor and furniture that I have found and share a couple little outdoor decorating tricks as well. Last week, I shared a sneak peek of our pool house/outdoor kitchen project that we have been working on since last August. I haven’t shared the full project yet because we’re not quite finished. However, in the next couple of weeks, I will be sharing everything and I cannot wait for you guys to see it all! I wanted to do this patio decor post early because there are some great outdoor furniture pieces and decor in stores already and I wanted you guys to know about them before they sell out. If you missed it last week, here’s a look at what I have done so far inside the pool house/kitchen. Let me just tell you, for the last 7 months, I have researched, re-researched pretty much every piece of outdoor furniture and decor that you can imagine. Because we needed to fully furnish the pool house/outdoor kitchen and pool deck, I needed to make a decision on what pieces to splurge on and what pieces I could cut corners and save. I want to share it all with you for those of you who are in the market for new patio furniture. I also wanted to give you tips on what patio furniture materials will last the longest. I live in East Texas where the weather can get extreme. In the summer, we have extreme humidity because we are so close to the Gulf and temperatures easily get consistently above 100 degrees. However, we are on the tropical borderline and in the winter, we do experience 2-3 hard freezes. We have a pool, so all of our outdoor furniture remains outside in the weather all year. I have learned the hard way over the years what furniture materials hold up and which ones do not. 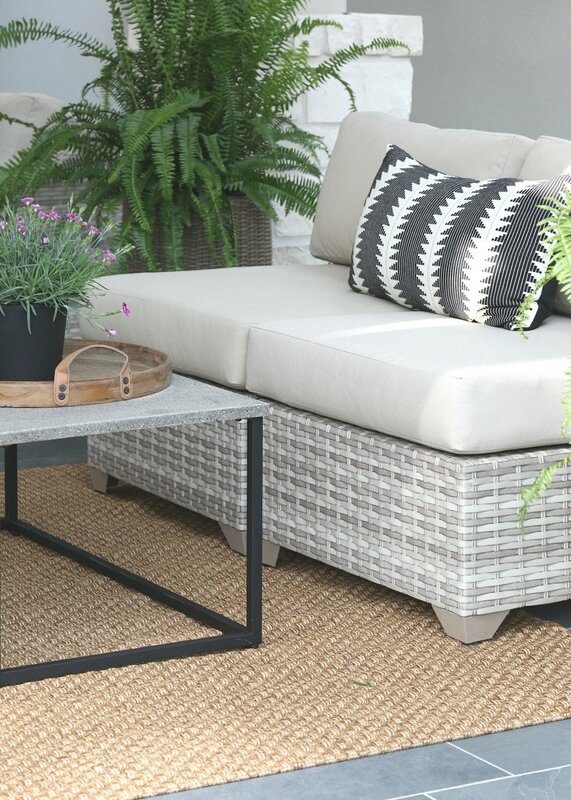 The outdoor sectional and sofa material that holds up (by far) the best are those pieces made with polyethylene wicker. Those are the pieces that look wicker but are plastic. This material will last for many years and look brand new! Prices on these sectionals can vary greatly and when I researched the sectional for our pool house, I researched everything and read every review and the ones made by TK Classics were always the best prices and generally positive reviews. 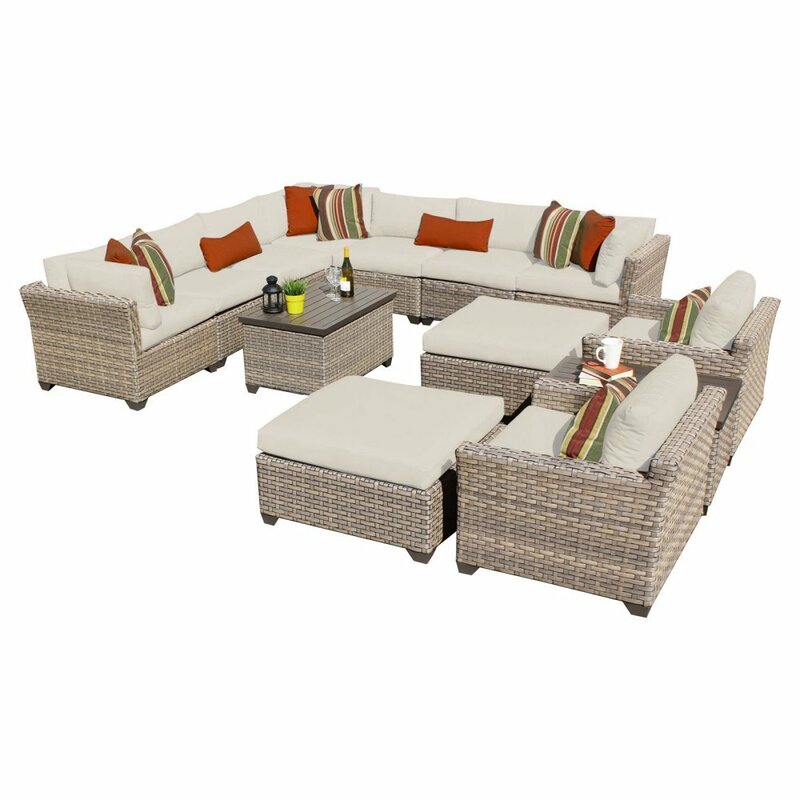 I ended up purchasing the TK Classics Fairmont Collection 13 Piece Outdoor Sectional at Overstock. However, this 13-piece is no longer available on Overstock. I broke up the set into three different groupings in my pool house. Here you can see how I did it (the two club chairs and ottomans or on other side and not in the picture). 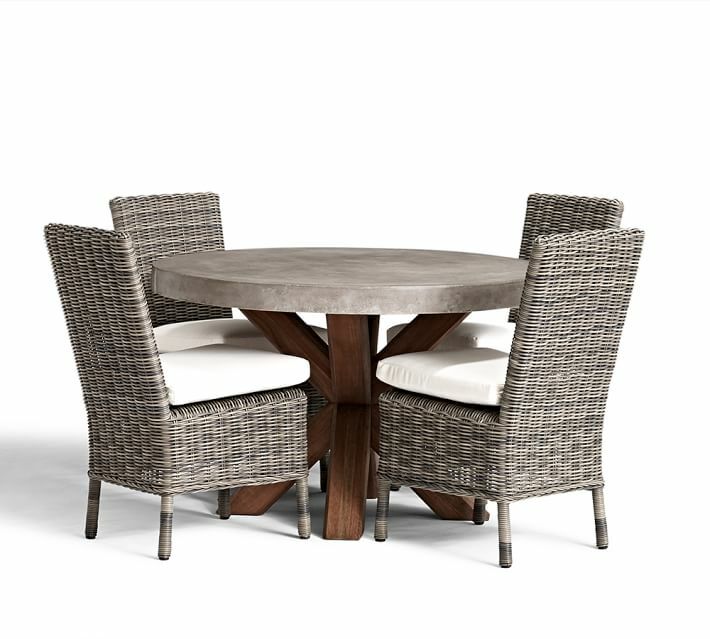 While there are many different colors of outdoor sectionals/furniture made by TK Classics, I wanted a very light white/gray color, which was the Fairmont Collection. I paid $2,600 for my set and while this exact set can be found on Hayneedle, they are selling it here for $5,500! Ugh! However, if you are interested in this sectional and are willing to go just a slightly darker in color, the exact same 13-piece TK Classics sectional in the Monterey Collection is $2,545 here. The other thing that I loved about this sectional is that the cushion covers have a zipper for easy cleaning. The frame is really well made frame but still light enough that I can easily move around. The TK Classics sectionals/sofas do not come with connectors to connect each piece together but I simply ordered connectors on Amazon. If you like the look of the TK Classics but do not need this many pieces, there are all kinds of different configurations, colors and collections here. The TK Classic plastic wicker pieces are very reasonable compared to other sectionals that I considered on Frontgate and Restoration Home that all cost over $10,000 on those sites. There is no need to spend that kind of money when TK Classics are a lot less expensive, just as durable and beautiful. Because of that, this was not something I decided was worth splurging on. 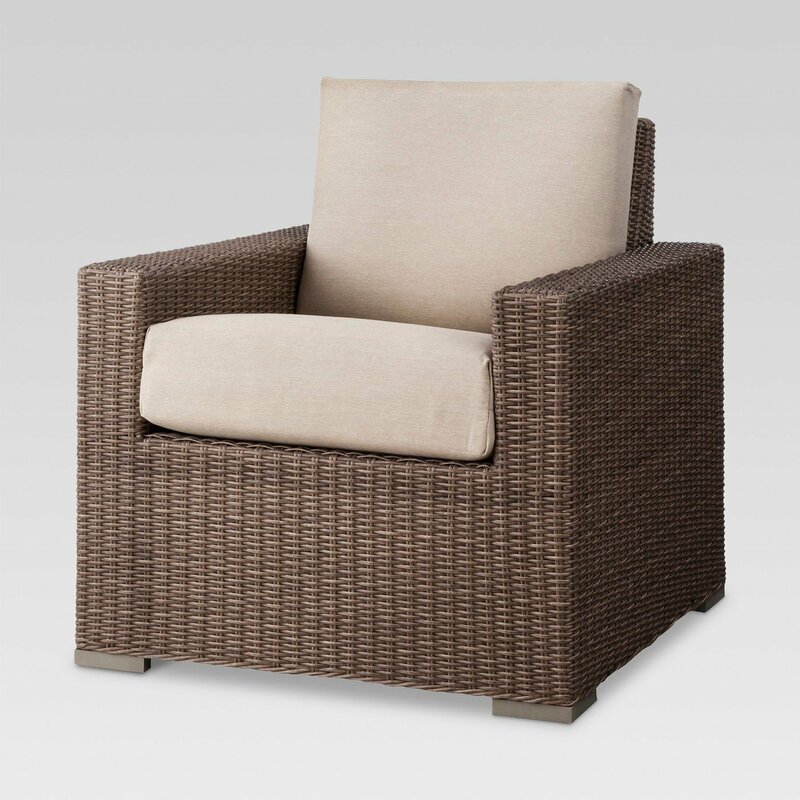 If you want to go much lower in pricing for the same plastic wicker material for outdoor sofas and club chairs, I LOVE Target’s Threshold Heathstone line here that is much less expensive and these pieces will also last forever. I have many of these pieces that have lasted for years! This was my patio set up last summer (before our pool house was built) with the Target Threshold pieces that I bought individually. Over the years, I bought the Target Threshold furniture pieces to create conversation areas and those pieces years later still look like new! I have learned over the years that when it comes to outdoor tables and chairs, you get what you pay for. I knew going into this that I would splurge on a good table and chair set made out of the most durable material. I also knew that I wanted the polyethylene wicker chairs for sure (the plastic like wicker material that I talked about above). Because my table and chairs would not be covered, I needed to make sure that whatever I decided on would last for years! After much research, I went with the Abbott Table and Chairs set from Pottery Barn. 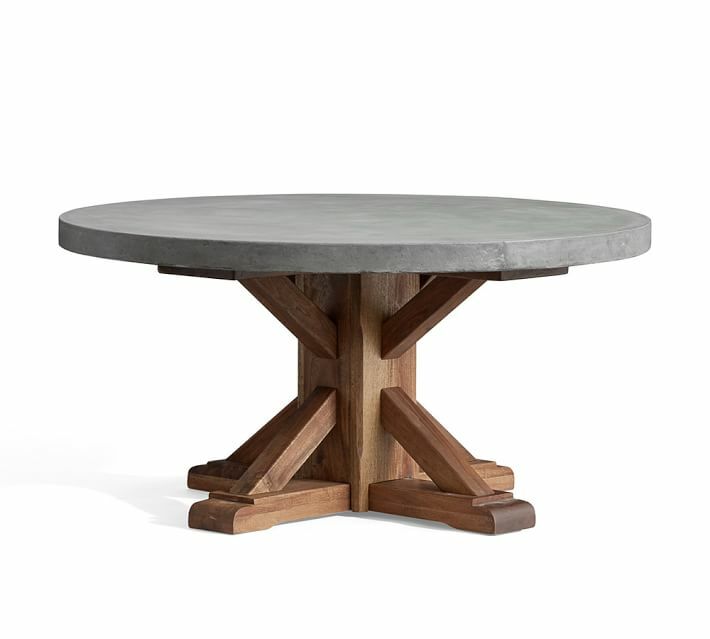 I knew the cement-like table top finish (which is a very heavy-duty) poly-resin type material would hold up over the years. I also knew the wicker chairs would hold up as well. Because the wood is designed for outdoors and it’s fully covered by the table, I splurged on this piece. In the background, you can see the Pottery Barn table and chairs (we’re still working on that area). 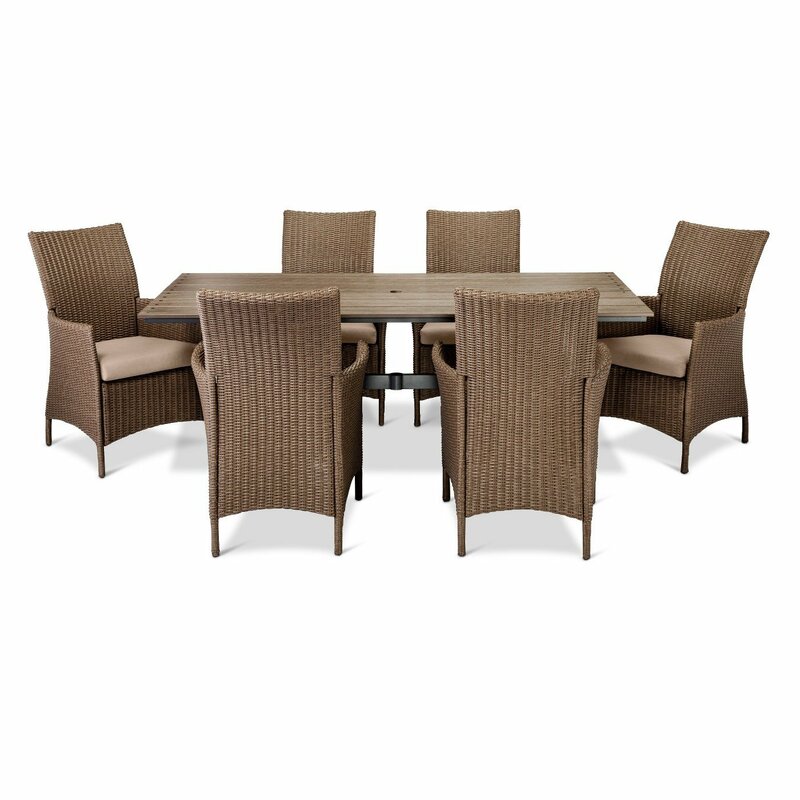 Target Threshold Heatherstone has a collection of dining tables and chairs that are far less expensive and durable. You can always buy a table and chairs separately to create your own set. I have learned the hard way over the years to only buy Target outdoor rugs. I have splurged in the past and nothing ever holds up beyond a year except Target rugs. Target tests all of their products for durability and you can spray off mold and mildew with the garden hose so easy and the rugs always look like new! 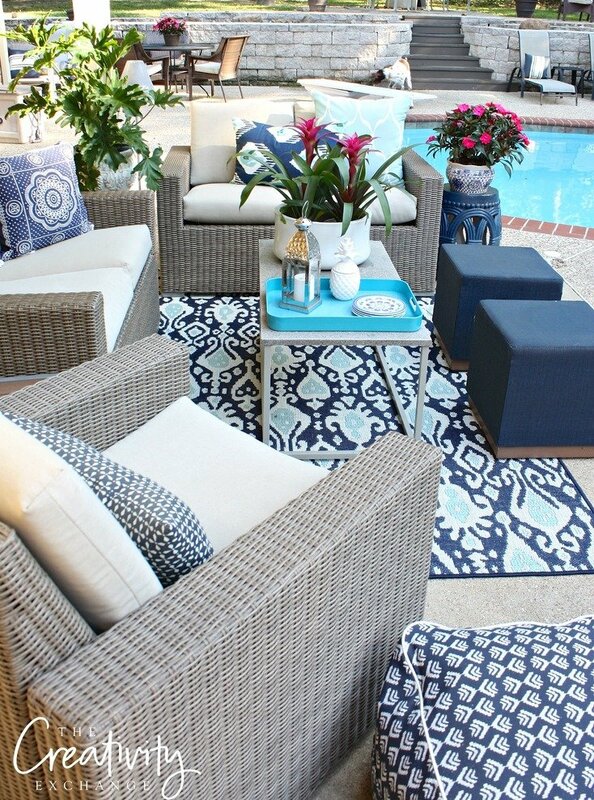 Plus, Target outdoor rugs are usually the least expensive. So there is no need to splurge when it comes to outdoor rugs because Target (in my opinion) is hands down the best, prettiest and most durable. 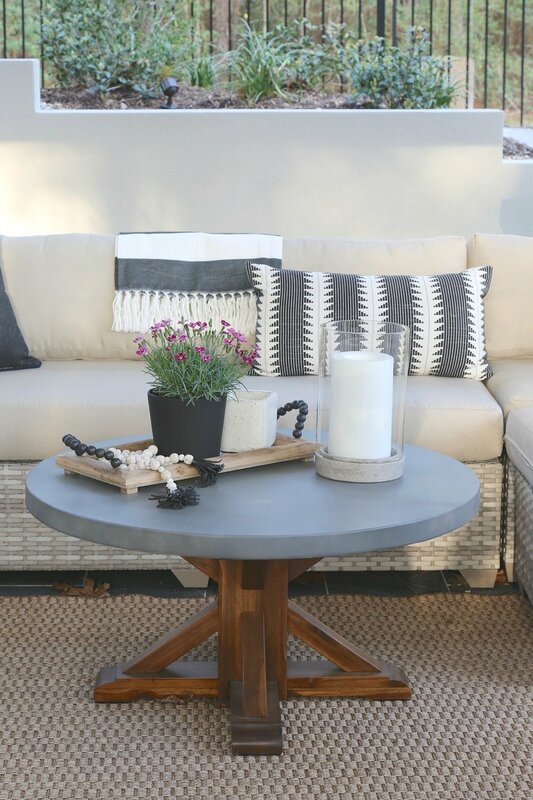 When it comes to outdoor accent tables and coffee tables, you do not need to spend a whole lot to get a great table. For my pool house, I did splurge on one of my coffee tables. I wanted the matching coffee table to my dining table that I mentioned above and went with the Abbott Outdoor Coffee Table from Pottery Barn. 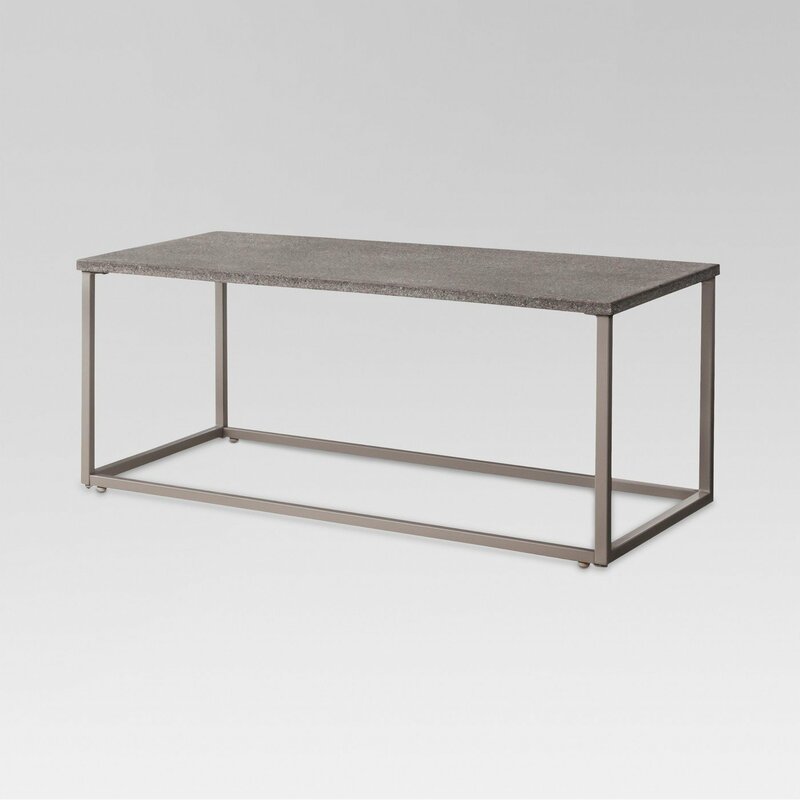 While the Abbott coffee table is extremely durable, the splurge was just something I really wanted to have but not necessary at all (don’t tell my husband that!) 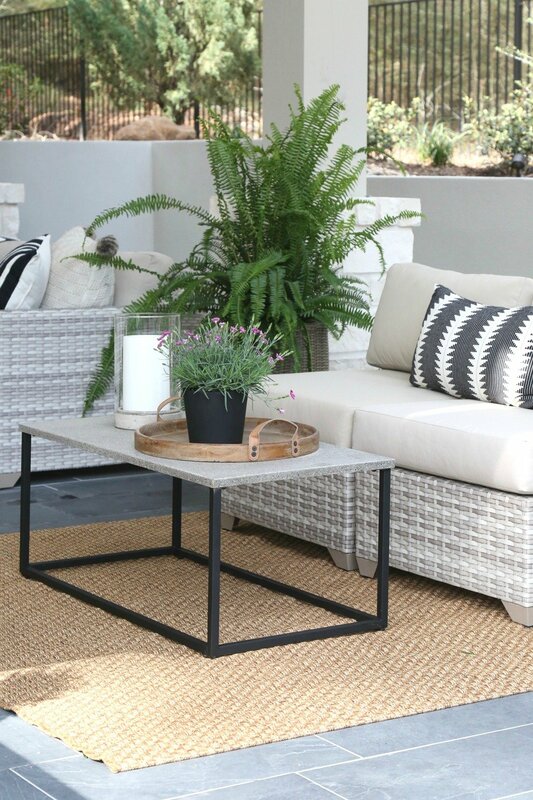 However, there is no need at all to spend a lot of money on outdoor accent tables because (again) Target has fabulous ones that are durable and very inexpensive. Years ago, I purchased this Target Heatherstone Coffee Table (which is under $100) and I have loved it and it has held up for several years. A couple weeks ago, I shared a post here where painted the legs of the table matte black to make it more modern. Again, Target has so many fantastic and inexpensive outdoor accent tables that you can look through here. One last thing I wanted to mention was choosing a color palette. For me, it was easy because we painted the pool house Burmese Beige by PPG Timeless and the ceiling we painted White also from PPG Timeless. Because these colors are neutral, I could have accented with anything like navy, turquoise, etc.. However, I opted to accent with charcoal, black and white/creams. 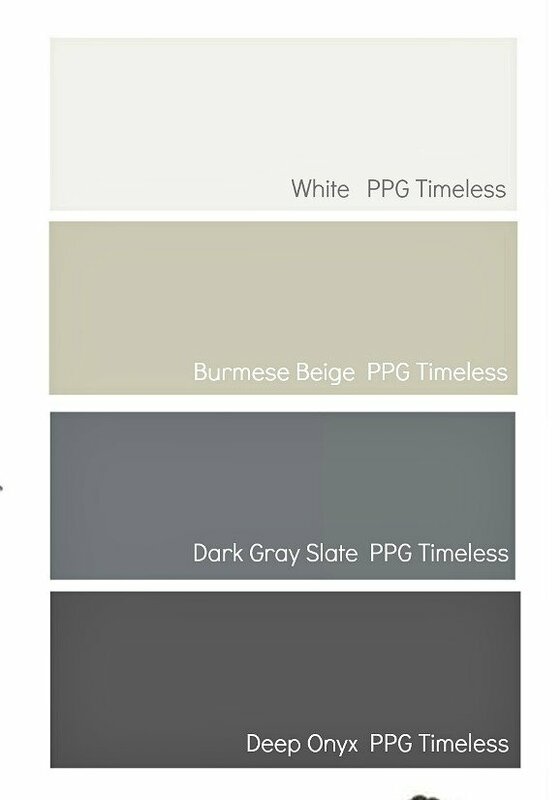 Here are all the PPG Timeless paint colors that I used for our outdoor project. I’ll be sharing all the exterior paint details shortly! When I started choosing accessories, pillows, etc.. 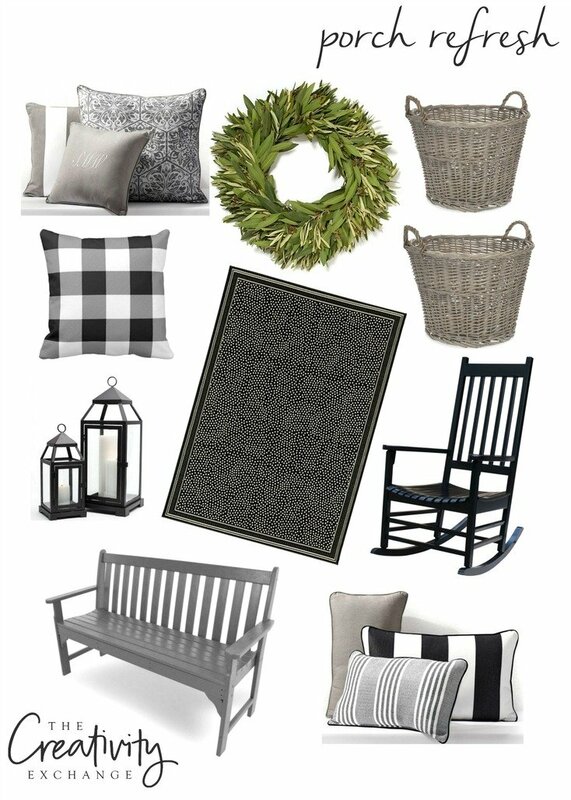 I immediately loved all the black and cream pillows from Target and knew that would be my palette. 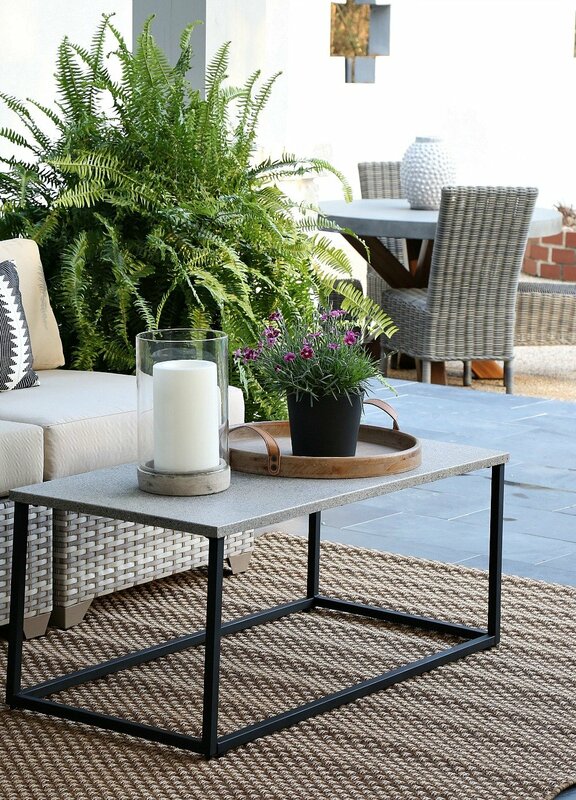 Finding accessories that you love is really the best place to start when it comes to layering outdoor spaces. 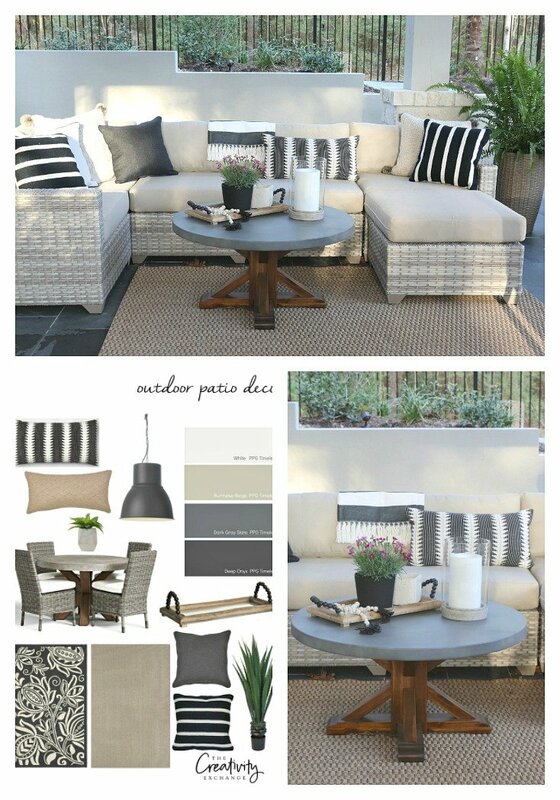 Find your inspiration from outdoor pillows, rugs, etc.. 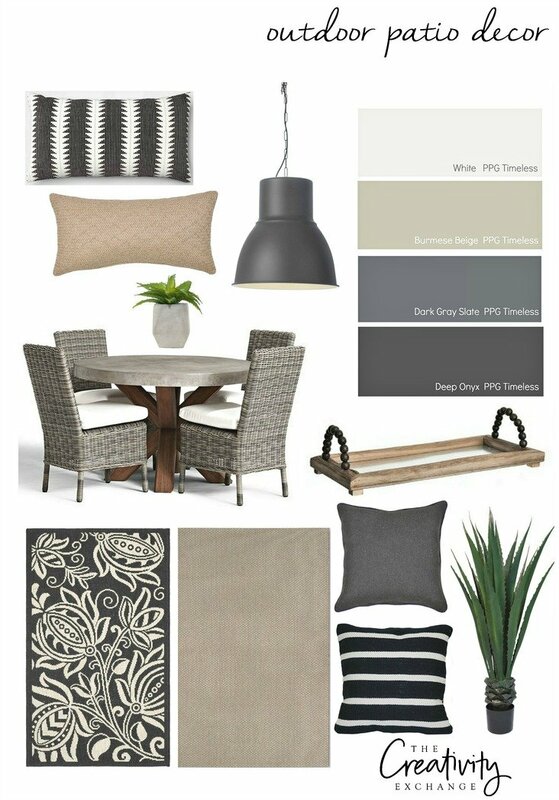 So here are all the links from today’s mood board and al the pillows, accessories and furniture that I used in our outdoor space. You’ll find the links directly below the image. 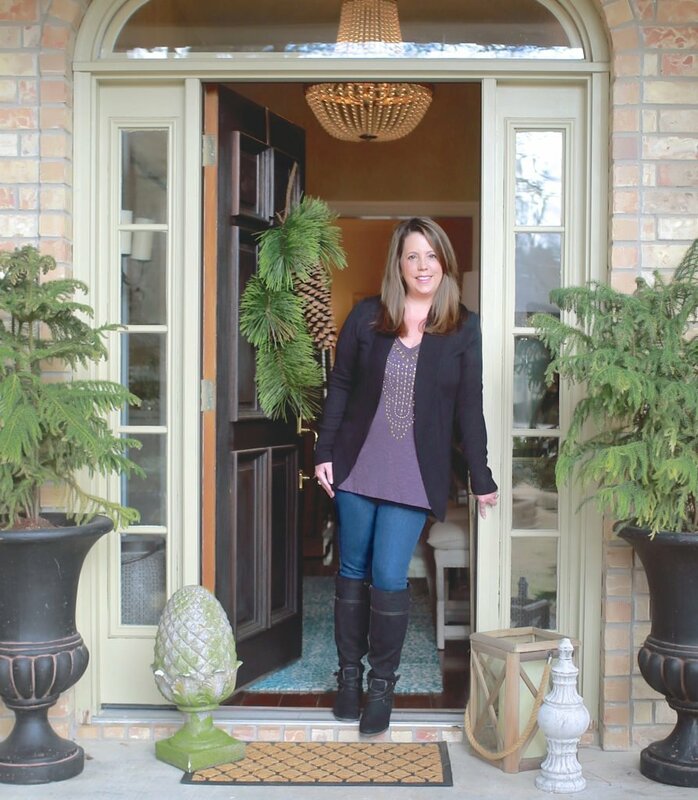 I really hope that my post today helps you when it comes to choosing outdoor patio decor, furniture and accessories. 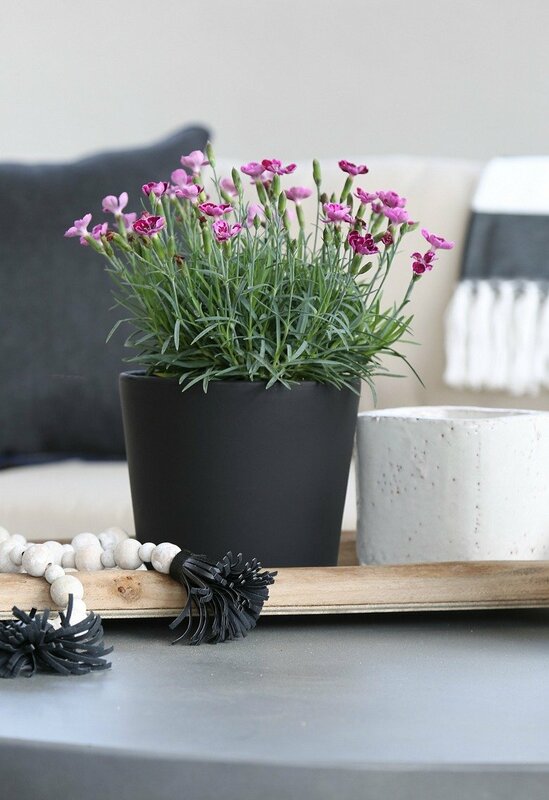 If you want more ideas and inspiration, last year I shared a porch decor Moody Monday post here with more ideas and accessories. Thanks for stopping by today friends and have a great week! I am in love with this space! Perfect decor! Love the mix of textures! Gorgeous space! Thanks so much for sharing your tips and suggestions based on your thorough research! Can’t wait to see the finished product!!! Great job! 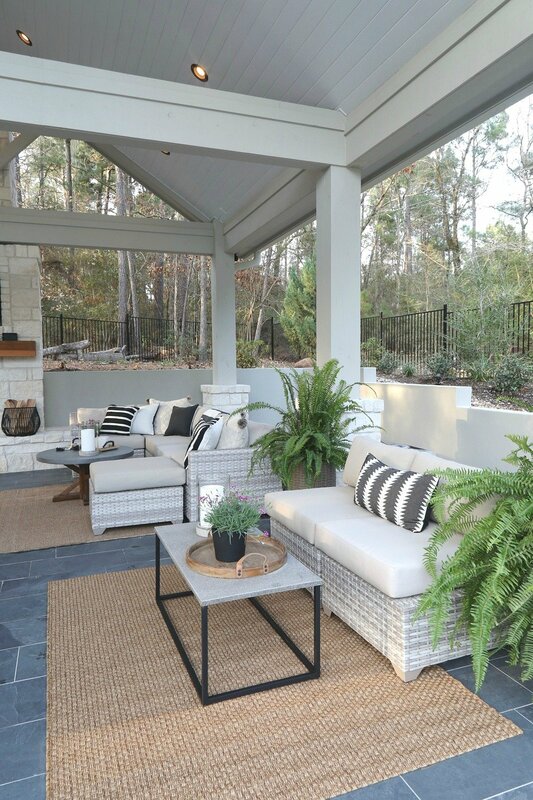 I have outdoor patio envy! You have done a fabulous job with your new space! Absolutley beautiful! I clicked over to this source guide hoping to find the bar stools! Did,I miss something? Please share! Any word yet on barstools?!? I love your outdoor kitchen area. Absolutely beautiful! Can you tell me where you purchased your bar stools? Thank you! We are about to tackle this very same project. Our plans are similar, mine includes a bath and shower and one exterior wall. I would love to know what your square footage is and the budget. I have done interior spaces before but not outdoor so am not sure how to budget/sq. foot. Thanks and any info would be great. The square footage of our outdoor kitchen/patio is around 1300. Total “all-in” including furniture, fixtures all kitchen appliances was a little over $160,000 when all was said and done. However, I live in East Texas, where construction labor costs are extremely low. I would venture to guess that your construction costs for the same project/sq. footage would be higher in Northern California. Also, we had to excavate dirt for 6 weeks because we had a split level yard. Excavating wasn’t crazy expensive but probably at least $10,000. 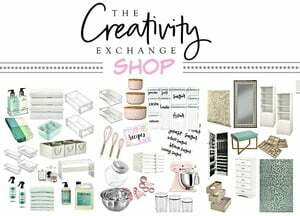 Feel free to email me if you have more questions at cyndy@thecreativityexchange.com.